Our aim is to provide readers/followers with high quality content and free betting tips for all sports. We place great confidence in all our tips and make sure all recommendations are fully researched. We back all posted tips so if you lose, we lose and if we win, you win! Please read on to discover our rules of using our selections. Any questions or feedback please email the address below. The first rule of gambling is only to bet what you can afford. So after working out how much the mortgage costs this month, how much the car insurance is going to set you back and sticking a decent wedge away so you can eat for the month, you need to create yourself a pot. This will be the money you strictly only use for gambling. They say size does not matter, and in this case it does not, so if it’s £10, £100 or £1,000 this will be will do as all will be explained in the next paragraph. 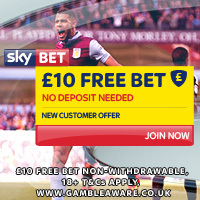 However, if you are feeling a bit short a perfect to give you bank a boost is to sign up for free bets and bonuses. At time of writing, the best offer is with Bet365. You can deposit up to £200 and they will match it with a huge £200 deposit bonus, which will start you off with a £400 pot to gamble with. Click this link to take advantage of this deal. Once you have your pot in order you must follow a staking system. We strongly suggest following this rule and we do this to collate and report our stats on the site. We simply dividing our pot into percentages before placing the bet. For example, if we predict that Newcastle United to beat Sunderland for say 2pts, and your bank is a total of £100, then you would place £2 on the Newcastle United win. The 2pts represents 2% of your bank, 3pts would represent 3% and so on. It is vitally important that you stick to this and if you have a bad day not to chase and go over these limits. Otherwise you could see your pot dwindling so remember to keep your composure and live to bet another day with your pot. Our vision is to supply high-quality selections, whether be pre-match or in-play and we will only provide tips we are confident in. Each selection posted on GetBetSmart.com will have a full explanation and article to tell you why we have picked that certain bet. On our Facebook/Twitter page, we will post specifically ‘In-Play’ bets which again, that we will fully research, mostly in games we are watching intensely to be sure of our selection. We will make available selections from a full range of sports and also provide regular bets from our gimmicks, which you can read more here. To keep our tipping fully transparent, full win/loss statistics are recorded and published on a regular basis on both our website and Facebook/Twitter pages. At the end of every month, we will have a monthly review article published to assess our performance and hopefully, celebrate our profits.